But if it was created it for a repertory theater–an opera house that alternates different operas on different nights–it’s most likely going to be revived. (If it isn’t, it was probably really, really bad.) After that nice four- to six- week period of rehearsals and first run of performances, the costumes go in the closet, the sets in the warehouse, and the big binders of blocking on the shelf. They will emerge later and be used to reproduce the production, usually with much less rehearsal time, different cast members, and sometimes without the presence of the original director. Pro singers are good at getting everything together in a hurry, but it’s understandable that a cast with longer bonding time is generally more polished. In a big repertory house like the Met or the Wiener Staatsoper, the majority of performances are such revivals. Vienna in particular is notorious for rehearsing its revivals for only a few days, often not onstage at all, before pushing everyone in front of an audience. (There is even a German expression for this: the Viennese Schlamperei.) So I thought it would be interesting to look at how this process effects different sorts of productions. The repertory of the Wiener Staatsoper contains many ancient productions of little ambition, with realistic sets and schematic blocking for everyone. There is a lot of parking and barking, and points when someone purposefully walks from one side of the stage to the other. An example of this is the Lucia di Lammermoor that I saw in January. Theoretically, these productions offer minimal interference for singers who brought a complete interpretation in their suitcase. While individual performances can be striking, collaboration between the various cast members is often not a factor, nor is any overall vision of the opera’s meaning. And these productions often end up with no one really doing much in the way of theatrical interpretation at all, though they can be eminently worth hearing. But Regietheater doesn’t always revive well either. 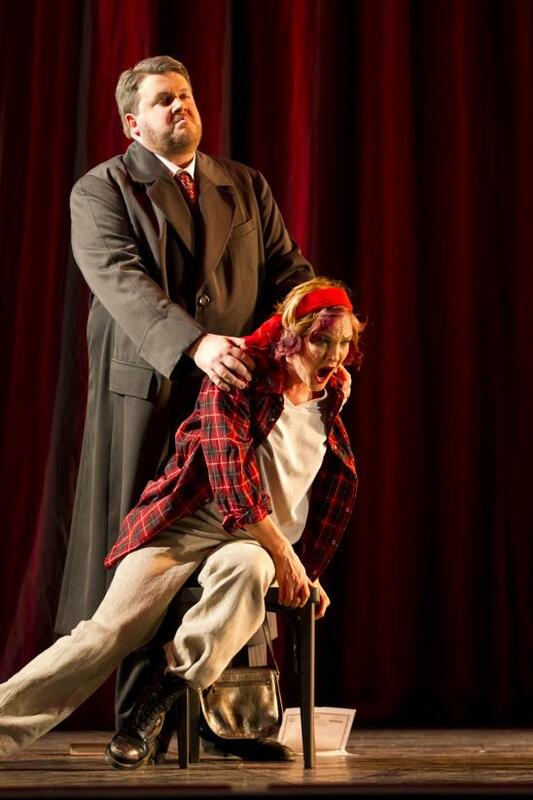 Take Peter Konwitschny’s Traviata, which I recently saw in Graz. The set consists of some curtains and a chair, the costumes modern street clothes. The center of the production was the Personenregie–the acting, particularly the interactions between the characters. That’s not easy to recreate with new singers in a week or two, especially if the new Violetta isn’t ready and inclined to play the character in the same way that Marlis Petersen did. Because Petersen’s interpretation of Violetta was an important and integral part of the production, unlike any of the performances in Lucia, and a major reason for its success. You can’t necessarily copy and paste this performance onto a new soprano, who won’t have the time to immerse herself in the production and will understandably want to create the role for herself rather than just imitate another performer step by step. The results are almost always a good notch below the original run. Of course it’s not that black and white. Sometimes a boring production’s cast can unexpectedly come together and sometimes replacements in Regietheater can work out well too, even improving on the original cast if they fit the director’s concept better than that hopeless baritone from the prima. And Lucia and Traviata are extreme examples; most productions fall somewhere in between. But Regietheater is still best seen in revival in opera houses where rehearsal is not a foreign word and/or some of the original cast members are present. Absent those things, productions can become incoherent in a hurry (the fate of Christine Mielitz’s Holländer in Vienna). Maybe for this reason, many of the theaters who perform the most and best Regie are those with strong regular ensembles of singers who are present from season to season, such as Frankfurt, Stuttgart, and the Komische Oper in Berlin. 1930’s, but basic Carmen drag. The Met’s attempts to appear modern without offending anyone has led to a series of updated but fundamentally conservative productions such as Carmen, Hoffmann, Tosca, and the new Ring. They do not depend on detailed Personenregie like Konwitschny does, but their visuals do more to interpret the story than a plain traditional Lucia does. Of course there are still problems, like in the Carmen, all the Don Josés after Alagna attempting to find a rationale for pulling out a cross in the final scene like the production makes them do (though that move was only somewhat more convincing when Alagna did it). But these productions have been underthought, their transposed settings chosen at random (why is Carmen taking place in the 1930’s?). They seem to be created consciously for repertory and changing casts, and their hesitation to put any individual stamp on the characters makes them decorative and boring. Even with a good cast, they rarely have the overall impact of a successful production that takes more interpretive risks. This is why I prefer a hot Regie mess over something as middlebrow as what the Met often puts out. Even if it didn’t work, I saw something new. The moral of the story is, if you are choosing between two operas, one a new production and one a revival, pick the new one. And some opera houses that may be located on the Ringstrasse in Vienna should be more responsible about rehearsing revivals and maybe not schedule quite so damn many of them. The Met has been improving on this front, bringing the original director back to rehearse revival casts, but the best Vienna has done is to exhume Otto Schenk to retouch something after 40 years. (Met performances are more dependably professional than Staatsoper ones, though many of the same people are involved.) Perhaps the real solution to this problem is the stagione system, in which only one opera is performed at a time, such as at the Theater an der Wien. Almost all the productions are new. On vaguely the same topic, if you have seen the current Aida at the Staatsoper, please leave a report below. I am suspecting it will be a revival of the worst sort and am not planning on going. Given good reviews I may change my mind, but so far I have not seen a single report. Also related, I will be in Munich later this weekend and will be seeing the brilliantly programmed double bill of L’Enfant et les sortilèges and Der Zwerg at the Bayerische Staatsoper, a new production. The Bayerische Staatsoper is currently my favorite opera house (despite not being immune to sloppy revivals themselves), and I’m looking forward to it! Well Zerbie, thats just about as comprehensive and informative a piece as one could for on the topic and should be mandatory reading for anyone relatively new to these things and trying to identify what's what and what to see. It also gets very incisively at the biggest problem I have with Regie which I commented on last summer. Specifically the problem of pasting a particular production on individual interpreters. You talk about Petersen's Traviata but I'm thinking more of the Herheim Rosenkavalier you reviewed earlier. Based on your description its almost certainly the production of the opera I'm most interested in seeing and probably one of the more curious currently "playing" in the genre. (I doubt it would be my favorite Rosenkavalier, but I've seen mostly traditional productions of varying effectiveness and antiquity) and am eager to try something different. However, and possibly quite a bit more than even the Graz Traviata, it is intensely dependent on a very extensive rehearsal period under the close supervision of the director. Moreover, given all the activity on the stage you would need an uncommonly large number of orchestral rehearsals just to coordinate the action, much less a meaningful interpretation from the pit, so important in this opera. It is almost inconceivable that such rehearsal time (3+ weeks?, 7 or 8 orchestra rehearsals minimum?) would be available at even the most conscientious repertory house. The production is, than pretty much limited to the original cast for maintaining its dramatic impact and musical quality and the effectiveness of even the former is likely to atrophy rather quickly (a few season) with the absence of the director and loss of detail. Thus, it seems and especially poor vehicle looking for looking at multiple singers and conductors over even a relatively brief time span. By contrast something like Vienna or Munich (Munich less so than Vienna), for all their many flaws, at least conceptually permit for powerful individual and even aggregate performances. As a practical matter your absolutely right about Vienna: generally and in Rosenkavalier one can encounter some extraordinary performances amoung (usually) pedestrian routine. At some point it just depends on whether one values an interesting total interpretation with (perhaps) a less than ideal cast or a potentially great individual performance. Hypothetically, lets say one were in Europe this summer on business, had a weekend off and could choose between seeing the Herenheim Rosenkav in Stuttgart or the Munich with Harteros. Although I'd really like to see both I would be inclined to come down in favor of the latter. In any case, whatever others' inclinations might be they could much more easily make a discerning decision after reading this excellent post. Although I enjoy your writing and this blog very much it would be nice if you could follow this advice from now on. Marcillac: This is only tangentially related to your comment but I should add, also for the enlightenment of Anonymous above, that I only wanted to address stage matters in this post. I pick things based on musical criteria sometimes too. But sometimes you just need to analyze things in isolation if you want to get anywhere. Opera is complicated like that! The questionable suitability of Regie to repertory houses–including most grievously the Mielitz Holländer–was one of the biggest points I wanted to make here. But I think that's more a point against the opera houses than it is against Regie. Is the operatic repertory system itself outdated? I wanted to try to ask what the best kind of production *is* for a repertory house, and I'm really not sure of the answer. I don't like the Met solution. I think I fall on the other side from you as to preferring a total interpretation. I can see your point, but honestly I would be more convinced if I couldn't count the great performances I've seen at the Staatsoper this season on one hand (most of them in new productions, interestingly enough! ), while if I take the train to see a Bieito production I can be pretty sure it's going to be something memorable. Anon: "From now on"? Is that an ultimatum? No one's paying me to do this and I write for my own edification and amusement. Also, see paragraph 1 above. A very good post on a very interesting topic. Due to having a child supernumerary in the household, I had the opportunity to watch a couple of revivals in Frankfurt. Interestingly, the length of the rehearsal period seemed to me to be often less important than the level of detail in the Regiebuch (which documents the original direction) and the preparation and authority of the directorial assistant charged with the revival. Institutional memory is also very important; in one of the productions I observed, 18 years old (and the original director actually deceased), there was actually a pair of supernumaries from the original production who were extremely helpful with blocking and movement. Above and beyond this, an engaged conductor can trump all, whether bringing the revival to life or allowing it to die an awful death. Very interesting. I recently had the opportunity to ask Isabel Bayrakdarian how rehearsals worked when a production had more than one cast; in this case the COC's Die Zauberflöte which had alternate Pamina and Taminos. I'd paraphrase her answer as "whoever shows up gets to decide". This really did show in the production itself where it was very apparent that Michael Schade was doing Michael Schade's version of Tamino having parachuted in with minimal rehearsal time. COC seems to be a hybrid of the two models you describe. With only seven productions per season there is time to rehearse and many of the roles are taken by locally based singers or members of the COC Studio Ensemble but typically some of the cast will be "big names" and often will arrive at the last minute. Well if you put it that way …. It is hard to find a good repertory solution. Munich is somewhat adventurous (not always successfully so) in a less half a$*#&, patronizing way than the Met. The standard for repertory performances is MUCH higher than in Wien (not sure why that should be). With some improvements this could a decent way to go. With individual productions/performances there are just too many moving parts which are too closely concerned to individual preferences to address in a systematic way. Again, to the extent some of these issues can be delineated with useful clarity, you do so here. That's really interesting about Frankfurt! It seems like a bit of a crap shoot, unfortunately, just like the COC's people-who-are-there policy that johng describes. But that's what makes going to the opera exciting, you never know when the stars are going to align. It does seem like some places are consistently more responsible and competent than others, though, not necessarily commensurate with their international reputation. I agree with Marcillac about Munich, I am a little depressed about returning to Vienna after having seen yet another musically excellent and scenically thought-provoking production there and realizing the Wiener Staatsoper just isn't that good. I really liked this post, as it gives serious consideration to why interesting is memorable and preferable to merely traditional and "middlebrow." (I'm not saying that traditional is always middlebrow, or that it can't be interesting.) My own tastes run toward interesting, too, even if this means it's a hot mess. I just attended the SF Opera annual meeting today, and the GD revealed that he's moving the company to a more stagione structure in place of our limited-repertory one. We're too small to do revivals in consecutiive years, but staples like Turandot and Butterfly appear every 4-5 years, often with the same sets and "direction" but with different singers in the major roles. These become stale very quickly. BTW, I really like this line: "Theoretically, these productions offer minimal interference for singers who brought a complete interpretation in their suitcase." Great post, Zerbinetta. I thought of this question when I saw the Decker production of La Traviata at the Met, and compared it with the DVD with Netrebko and Villazon. Exact same production, but with singers of very different temperaments, it became a very different experience. Both Poplavskaya and Polenzani lacked the kind of raw energy that Netrebko and Villazon had in spades, so the storytelling became colder, more clinical, more a graphic depiction of dying than maybe even Decker intended. Excellent post!! Not that any of them read your blog, but some people in the world think any one opera is done in one way, all the time, the world over. Gadzooks! It is amazing (like Poison Ivy implies) what different personalities bring to an otherwise identical production. I had the pleasure of being in Christof Loy's "Orfeo" in Düsseldorf – the premiere and all subsequent revivals (spanning 7 years). The principals remained mostly the same – Ludwig Grabmeier's tireless Orfeo, Carol Wilson's phenomenal Musica – but only 3 of us anonymous Nymphs were in each revival. We had to witness the sad decline of our precious attention to detail. Despite the valiant efforts of a very talented Regieassistent, it was hard to achieve the interaction and drama of the original. Anyway, you get my drift. Grüße aus Hagen!